It's time for some big, bouncing fun with the Pure Fun 7ft Kids Trampoline with Enclosure! 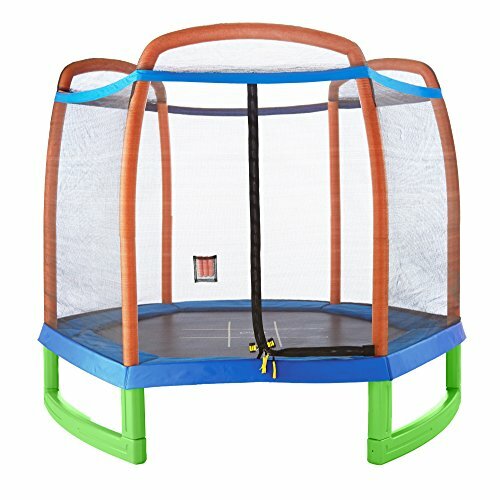 The large 7-foot, enclosed, jumping area is extra durable for young jumpers and has just the right amount of bounce. The safety net enclosure on all sides helps keep your children safe as well as the padded frame providing extra protection. The Pure Fun 7’ trampoline also includes a tic-tac-toe game mat with chalk and chalk holder. When kids want a little down time they can play tic-tac-toe or draw on the game mat itself. The mat is easily cleaned with a damp cloth or hose. This 2–in-1 trampoline play station gives your child many different play options combining physical and creative outlets for a day of Pure Fun!